Product #3794 | SKU 3SKB-1212M | 0.0 (no ratings yet) Thanks for your rating! Road tough military-style shipping case. The SKB 3SKB-1212M MP (Max Protection) Series ATA Shipping Case is a road tough military-style shipping case designed for taking real abused and protecting the contents. 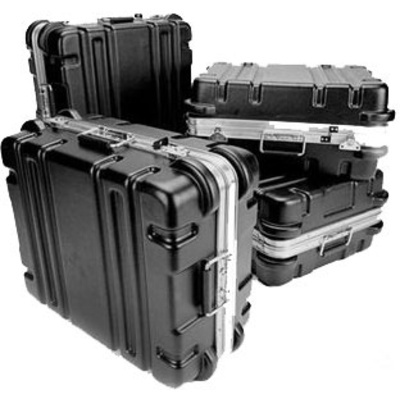 The case meets ATA specifications for transit and shipping cases. It has a gasketed, heavy-duty 'L" valance that ensures a secure closure. The MP ATA case is made of Thermoformed Polyethylene shipping case that is resistant to UV, solvents, corrosion, fungus and impact damage. It has molded-in protective bumpers, a heavy duty twist latch system and will accept optional padlocks. There are spring loaded handles and the case can be stacked securely. Thermoformed Polyethylene shipping case that is resistant to UV, solvents, corrosion, fungus and impact damage.